If you are on a time crunch for dinner and happen to have a Rotisserie Chicken on hand (or as a left over), and hoagie rolls, then this recipe makes a meal in about 30 minutes or less. 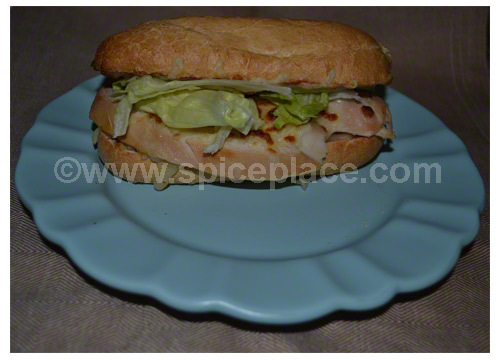 Slice hoagie roll in half and place on a baking sheet covered with non-stick aluminum foil. Evenly sprinkle Mozzarella Cheese and a little Parmesan over the sauce. Place the two slices of chicken on the bottom half of the hoagie. Sprinkle more Mozzarella and Parmesan cheese over top of the sliced chicken. Broil the sandwiches, with faces up so the cheese melts, bubbles, and browns (caramelizes). These cook quickly, so watch carefully so they don’t burn. Remove from broiler, let sit a minute, then top with shredded lettuce. Serve with potato or tortilla chips. Blend the Spatini, Italian Seasoning, and tomato sauce together in a large bowl. Microwave for 30 – 40 seconds to warm up. Stir again.